It is defined as the pieces of solid material not really stones that form in the gallbladder, a small organ located under the liver in the upper right abdomen which stores bile, a green-yellow liquid that helps with digestion. Gallstones are usually made of cholesterol that form in the gallbladder. Too much cholesterol in bile can lead to yellow cholesterol stones. Too much bilirubin can cause pigment gallstones. Physical examination such as checking eyes and skin for visible changes in color. Treatment is not necessary unless it causes you pain. Sometimes you can pass gallstones without even noticing. If it is causing pain then the doctor will recommend surgery. 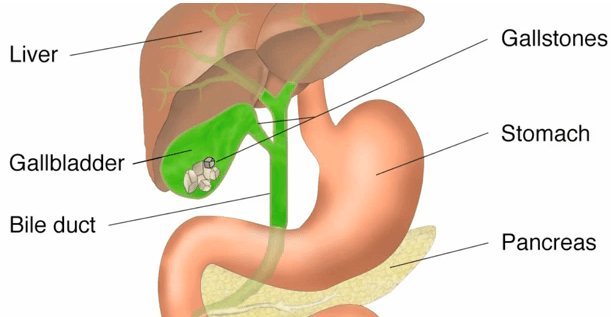 Laparoscopic cholecystectomy: The surgeon passes instruments, a light, and a camera through several small cuts in the belly. Open Cholecystectomy: The surgeon makes bigger cuts in the belly to remove the gallbladder.